Pedestrians pass photos displayed on the Los Angeles Times building in 2013. Business Editor Kimi Yoshino returned to the newsroom Thursday. 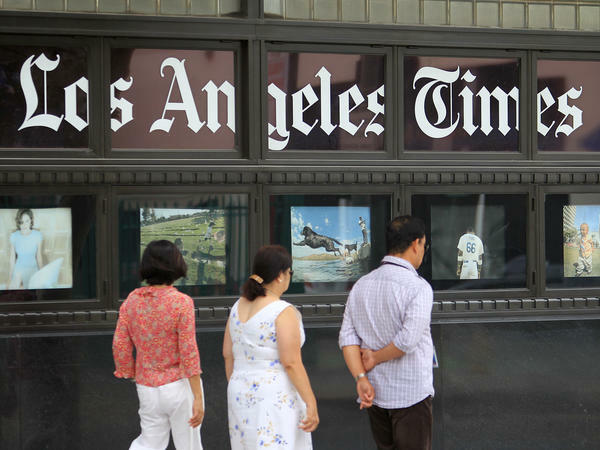 According to several staffers, Business Editor Kimi Yoshino told members of the LA Times business desk that the then editor-in-chief, Lewis D'Vorkin, personally walked her to human resources offices last week. Yoshino said she was then grilled over a conversation she had with New York Times reporter Sydney Ember in advance of a story published in that paper. That story revealed that reporters clashed with D'Vorkin at a November newsroom meeting over his handling of the Walt Disney Co.'s condemnations of the LA Times for its coverage of financial breaks given by the City of Anaheim to the entertainment giant. D'Vorkin had not publicly defended the LA Times' reporting even as Disney blocked LA Times reporters and critics from advance screenings of its films, inhibiting cultural coverage and movie reviews. The company lifted the ban after a meeting with D'Vorkin and LA Times Publisher Ross Levinsohn. Yoshino denied sharing any audio with the New York Times reporter, telling colleagues she simply had an innocuous conversation with Ember shortly before the story. In a second staff meeting in November, called in response to the New York Times piece, D'Vorkin said the leaks of the audio to Ember were "unethical," adding that "whoever was involved was morally bankrupt." Audiotapes of those remarks at the second November meeting were obtained and first reported by NPR. As described by her colleagues, Yoshino warned staffers on Thursday that the LA Times could well extend its investigation into the source of the leak to others in the newsroom. A spokeswoman for the newspaper's parent company, Tronc, told NPR Friday morning there was no current investigation into the leak of the audio. D'Vorkin did not respond to detailed questions seeking comment. Two LA Times staffers spoke to NPR about what Yoshino said; several posted highlights on Twitter as news of what Yoshino told her business desk colleagues started to break. Separately, Levinsohn was placed under corporate investigation two weeks ago after NPR reported on accusations about his past workplace behavior. D'Vorkin was shifted to a new corporate job Sunday after a brief and rocky tenure that included the newsroom voting to unionize for the first time in the paper's 136-year history. He has been replaced by Jim Kirk, who has served as a news executive and troubleshooter for Tronc. Kirk is a former Chicago Sun-Times editor and publisher. He served briefly as an interim editor at the LA Times last fall. "Kimi is back to work," Tronc spokeswoman Marisa Kollias said in a written statement to NPR. "We know Jim and his team want to help the entire staff get back to work doing what they do best — covering the news that matters most to readers of the Los Angeles Times." Yoshino had overseen coverage of Disney's relationship to Anaheim and also its reporting on the paper's own troubles, including the labor vote and the accusations against Levinsohn. Yoshino's staffers last week signed a public statement of protest in her defense; she did not return a message seeking comment but wrote on Twitter of her appreciation for their support on Thursday. "Throughout my career, I have held myself to high professional and journalistic standards, treating people with kindness and respect," Yoshino tweeted. "Under the leadership of @kirkjim12, I expect the L.A. Times newsroom will move forward guided by those same values."